Well, seven years ago when Matt and I moved to Texas, I decided that I wanted to open my own soft furnishings workroom…one of those places that makes all of the window treatments, pillows, upholstered headboards, and any other fabric creations for interior designers. So I took a rather extensive training course to become a Certified Workroom Professional. Well don’t be. I was actually a Workroom Professional training course dropout. I didn’t finish the course, I didn’t become “certified”, and I never opened that soft furnishings workroom, because I decided that making the things that other designers envisioned wasn’t really what I had in mind. I wanted to be the visionary…the designer…the one who created the overall plan for the room and decided what needed to go in it. But one thing I did learn from that course was the proper way to make lined draperies. 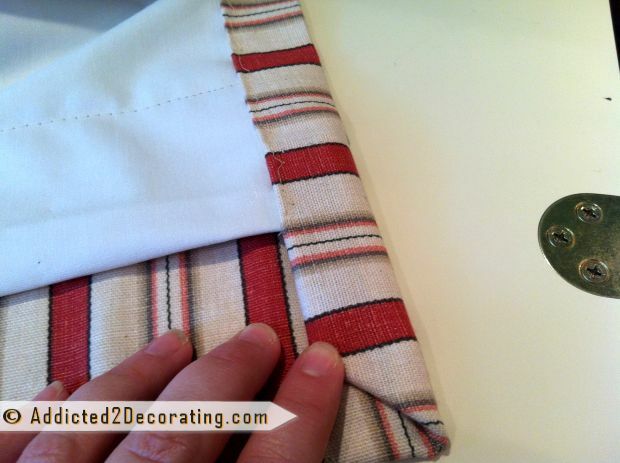 Note that you can use this tutorial to make simple lined, pinch-pleated draperies with one fabric. You can just skip past all of the first steps showing how to piece together the three fabrics for the panel, and skip right to Part 2: Hem The Drapery Panel Fabric. So are you ready to get started? Let me apologize up front for the quality of these photos. I worked at my mom’s house, and forgot my camera, so these are awful iPhone pics. But I think you can still tell what’s going on in them. First, you need to cut your fabrics. I was making drapery panels with a finished length of 89 inches (my standard for a room with an 8-foot ceiling), and a four-inch contrasting band on the inner edge of the panel, and the bottom edge of the panel. One piece of contrasting fabric (floral) that was one full repeat of the design (about 24 inches). If you’re using a printed fabric, be sure to cut full repeats of the design so that all of your drapery panels will be identical. 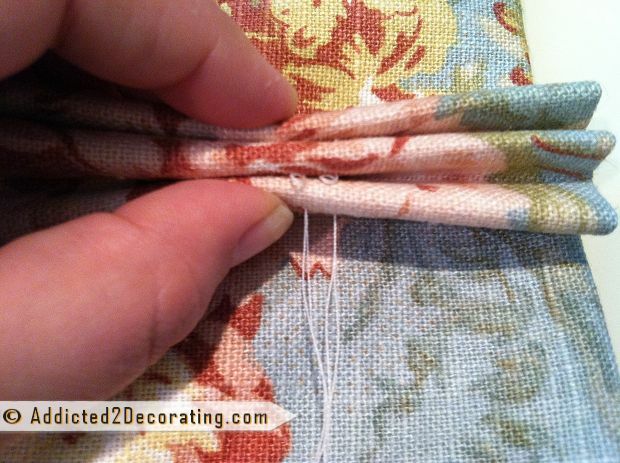 When you piece together the two widths of fabric for the side edge, be sure to sew them together so that the pattern matches and the seam is in an inconspicuous place. Be sure to iron the seam very well, on the front and the back, so that the seam disappears as much as possible. 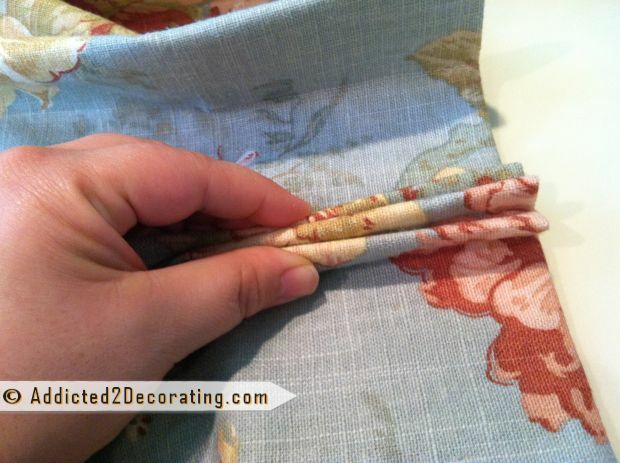 Now pin together the top contrasting fabric (floral) to the main fabric (cream). 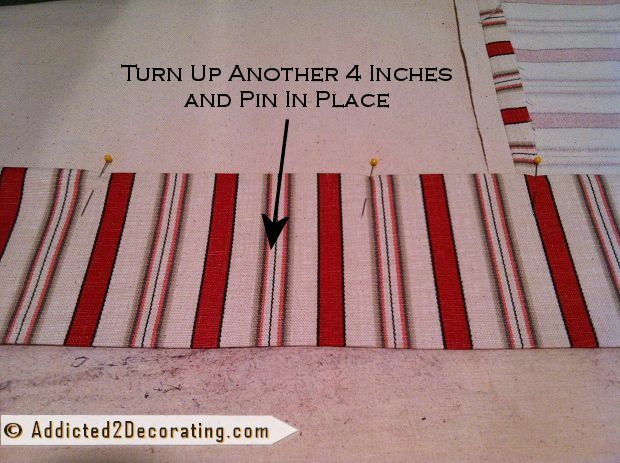 Pin the top of the main fabric to the bottom of the contrasting fabric with the right sides of the fabric together. Now sew these fabrics together with a standard 5/8″ seam, and iron the seam. I always iron my seams with the fabrics open, as shown below. Be sure to always iron on the back and the front for a perfectly flat seam. 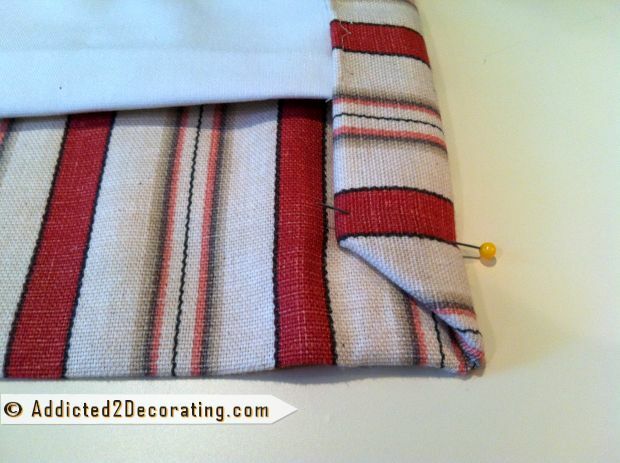 Now starting on the top corner, pin the side contrasting fabric (stripe) to the side edge of the panel. 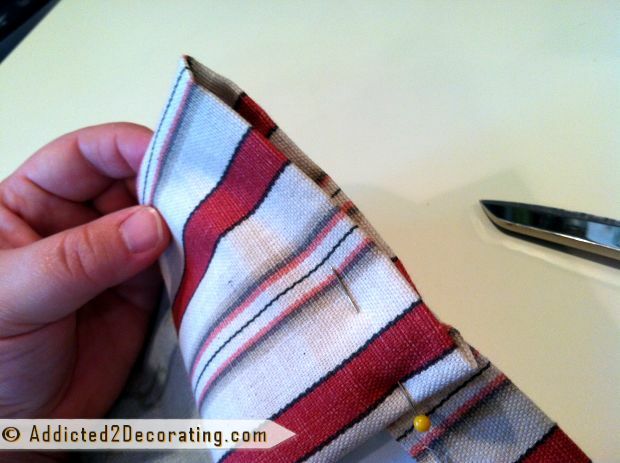 Pin all the way down and then sew with a 5/8″ seam, and then iron the seam. 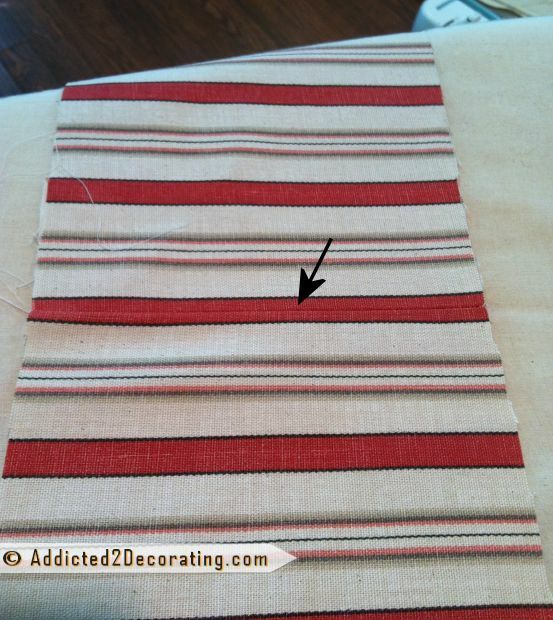 You should have extra striped fabric extending past the bottom corner of the panel. Do not cut this off yet! 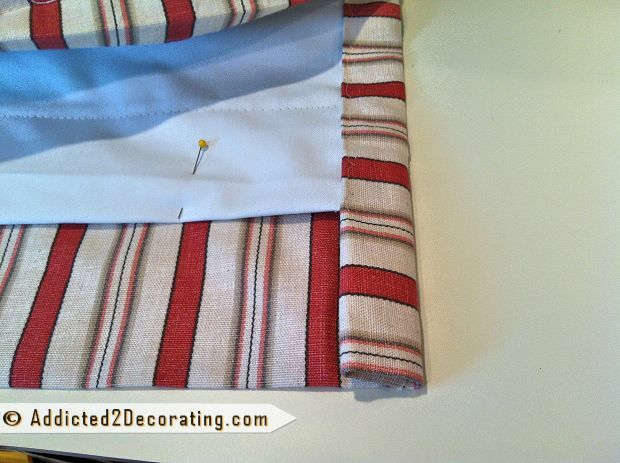 Next you will pin the bottom contrasting fabric (stripe) to the bottom of the main fabric, with right sides together. The corner, where the striped fabrics meet, will be tricky, as they need to be mitered. I wish I had some helpful advice on how to do this, but I don’t. I just worked and worked with the fabric, pinning, folding, repinning, refolding, etc., until I got the patterns to meet. Then I pinned and ironed in the mitered corner, sewed the contrast fabric to the main fabric, and then top stitched the mitered corner as close to the fold as possible so that the thread wouldn’t be too visible. After piecing everything together, the fabrics on the outside edge of the panel were all uneven, so you’ll notice in the picture above that I trimmed off the uneven edges so that the edge was perfectly straight and even. So on the bottom edge of the panel that you just sewed together, working with the front side of the fabric facing down on your work surface, turn the fabric up 4 inches, and pin and iron the fabric. Now turn the fabric up another four inches, and pin the hem in place along the top edge as shown. Again, be sure to iron the hem in place. 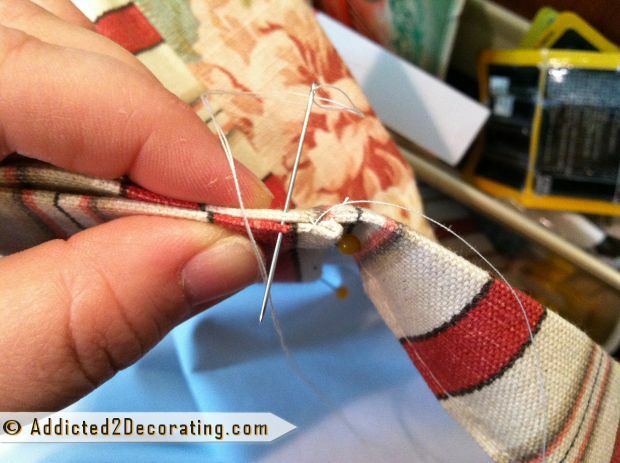 Now use the blind hem setting on your sewing machine to stitch the hem in place. I won’t go into the details of how to do a blind hem stitch, but here’s what the setting looks like on my older workhorse of a machine. 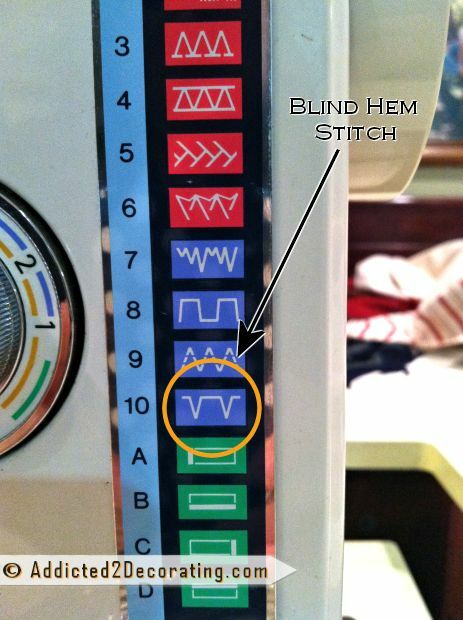 If you don’t know how to use the blind hem setting on your sewing machine, stop now, get out your owners manual, and learn. It is absolutely imperative that you learn this stitch in order to make professional-quality draperies. 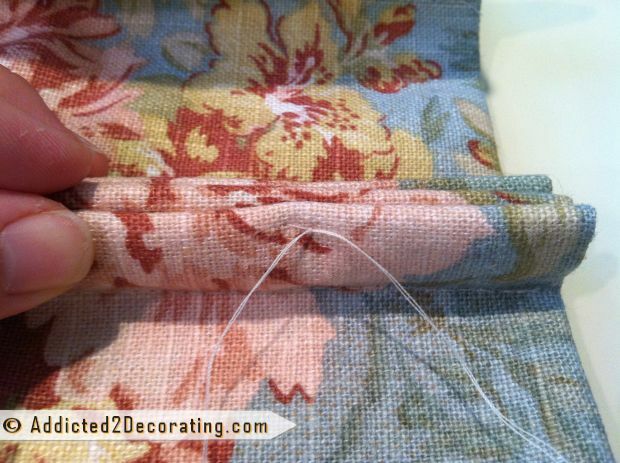 You’ll not only use it on the hem, but you’ll also use it later to sew together the fabric panel and the lining. So seriously…even if you’re like me and you hate reading owners manuals, this is one time that you need to make an exception. 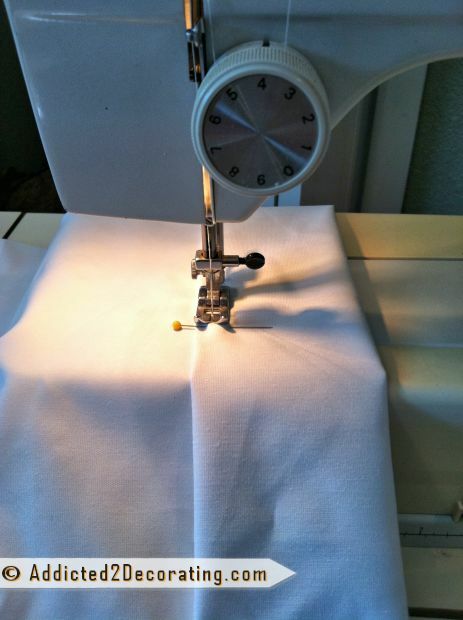 Go find your owners manual and learn how to do a blind hem stitch!! 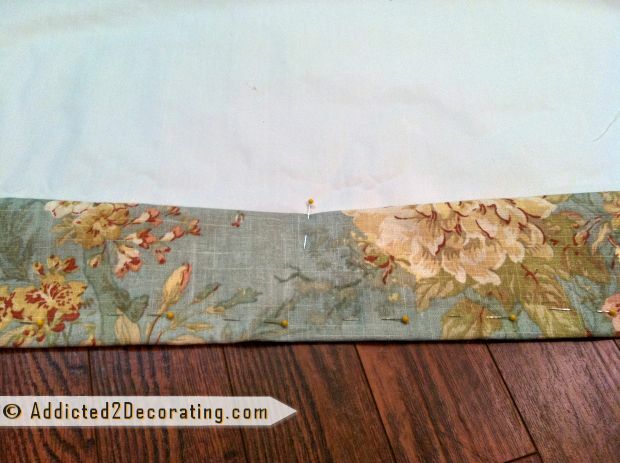 With the hem finished, you can now turn your attention to the side edges of the fabric panel. 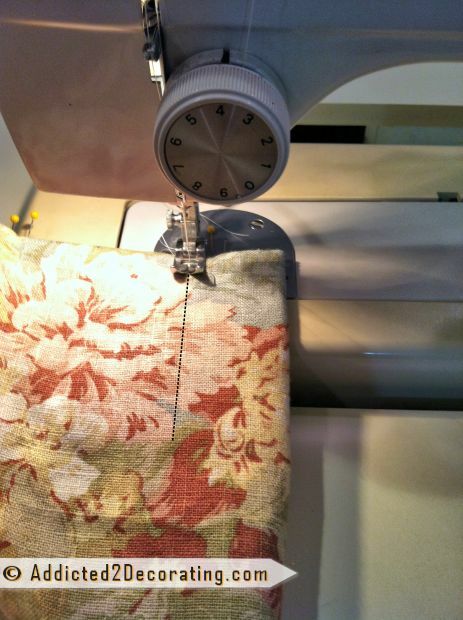 Again working with the front of the fabric face down on your work surface, turn the fabric 2.5 inches and pin and iron in place. Do this the fill length of the panel. 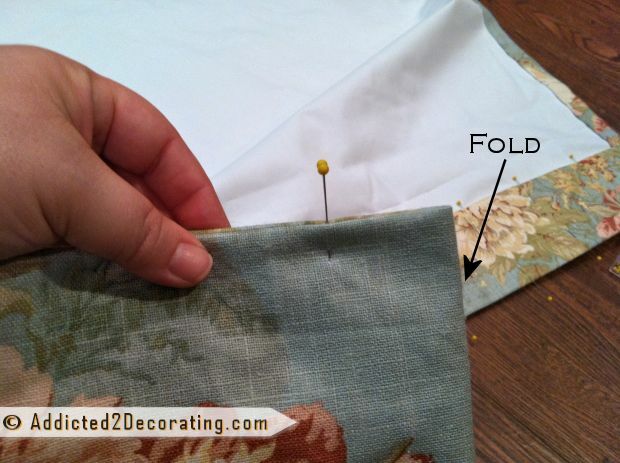 Now unpin and open the fold that you just iron in. 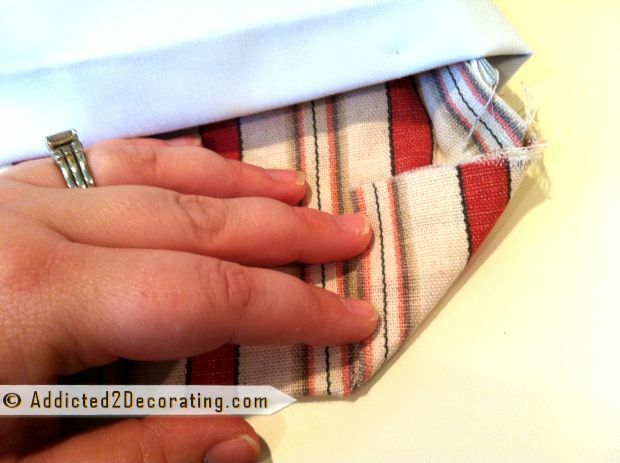 Fold the raw edge of the fabric right to the crease that you just ironed in. Then fold again along the ironed-in crease. Pin and iron the fabric. Do this the entire length of the panel. Now repeat the same process on the other side of the panel. Fold 2.5 inches, pin and iron. Unpin, refold, and pin and iron again. With the folds ironed in on both sides of the panel, you can put the panel aside for a while. Now we’ll turn our attention to the lining. I tend to prefer blackout lining, as it’s heavier, and I think it makes draperies look better. Sun streaming through your drapery fabric can not only fade the fabric, but can also distort the color of the fabric. I once made unlined curtains from a fabric with a small red plaid print, and when the sun streamed through the fabric, the fabric turned orange. It wasn’t pretty. Blackout fabric will keep the sunlight from distorting your fabric colors. 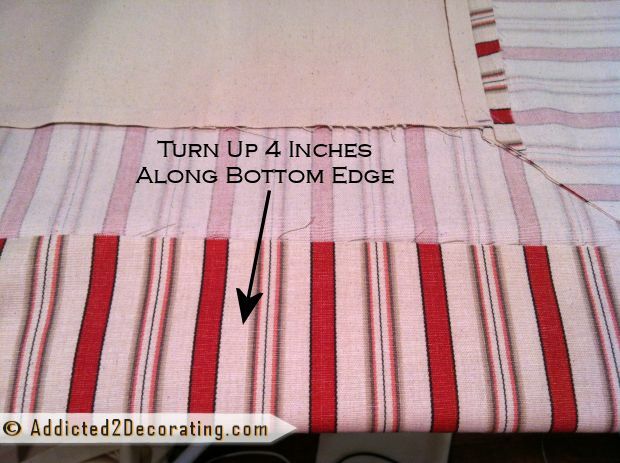 Working along the bottom edge of the drapery lining, with the front of the lining facing your work surface, turn the fabric up three inches, and then turn it up three inches again. Pin and iron into place. Note: On blackout lining, the side that feels more like fabric is the right side. The side that feels more rubbery is the back side. Now sew the hem into place. On the lining, I don’t bother with a blind hem. I just sew right on top of the fabric, as shown. Now you’re ready to attach the lining to the fabric panel. 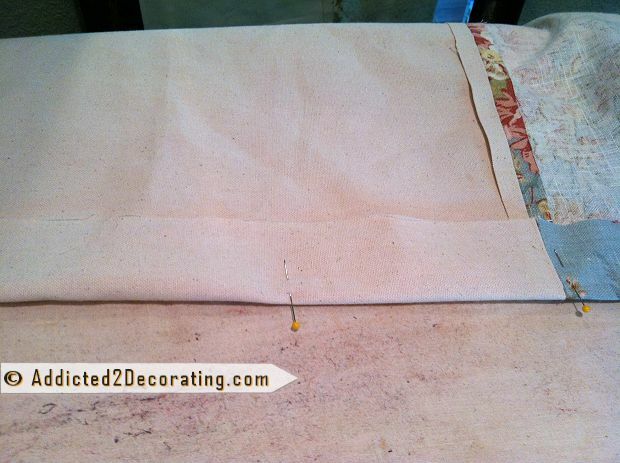 Start by placing the fabric panel with the right side facing down. Be sure to spread it out so that there are no wrinkles (if possible). Now starting on the bottom corner, unpin and unfold the side of the fabric panel. The fabric is folded twice. You only need to unfold the first fold. 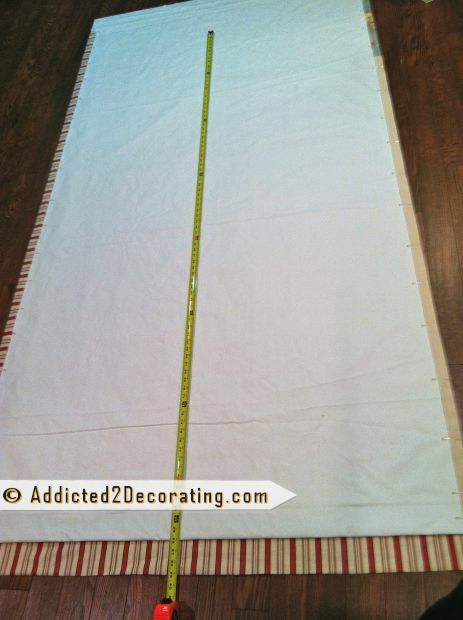 Measure three inches up from the bottom of the panel, and place the lining on the panel, with the right side facing up. 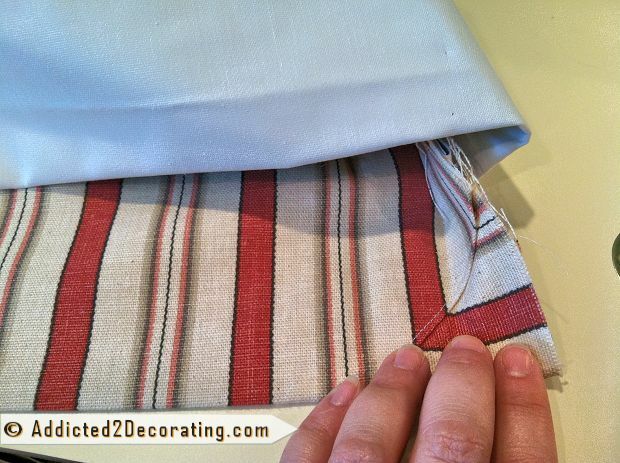 Be sure that the raw edge of the lining is very close to the ironed-in crease in the fabric. Now refold the edge of the fabric panel so that the raw edge of the lining is tucked under the fold. 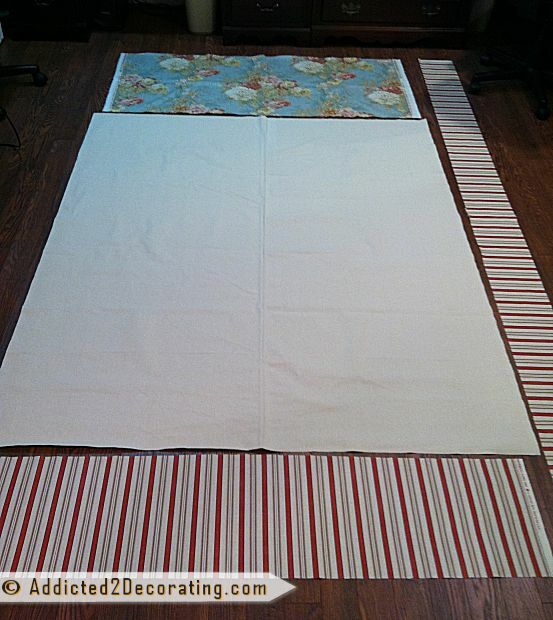 Do this the full length of the panel, and pin the fabrics together as you go. 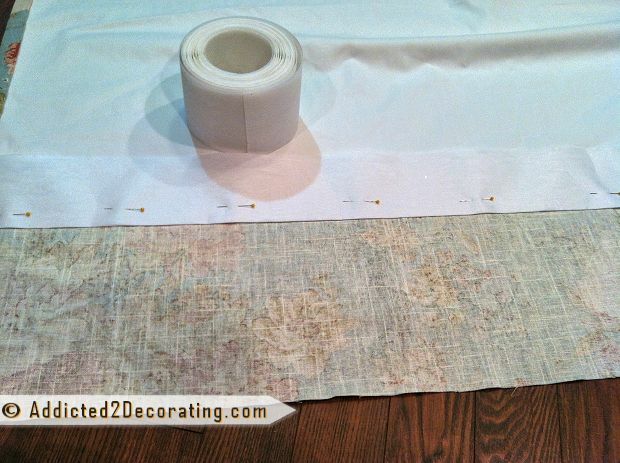 Now spread the lining out flat across the fabric panel, and be sure to keep the bottom edge of the lining 3 inches from the bottom edge of the fabric panel. You can pin the bottom in place if you need to. On the other edge of the lining, it will extend past the edge of the fabric panel. 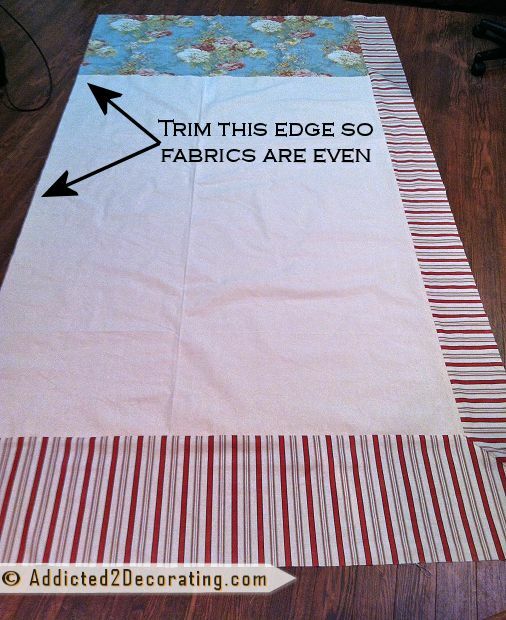 Just cut off any excess lining, but be sure to keep it as close to the edge of the fabric panel as possible without allowing it to extend past the edge. Trim off the excess lining the full length of the panel, and then tuck the raw edge of the lining under the side fold on the fabric panel, just like you did on the other side. Pin it in place the full length of the panel. 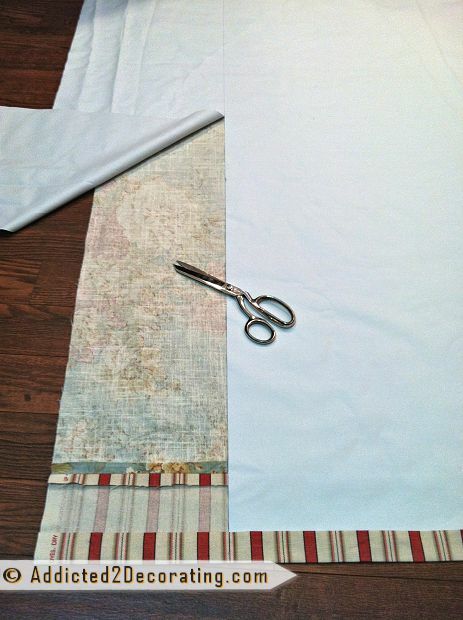 With the sides pinned, you’re now ready to measure and mark the finished length of your drapery panel. (I marked mine at 89 inches, which is the length I use for almost all windows in rooms with 8-foot ceilings.) 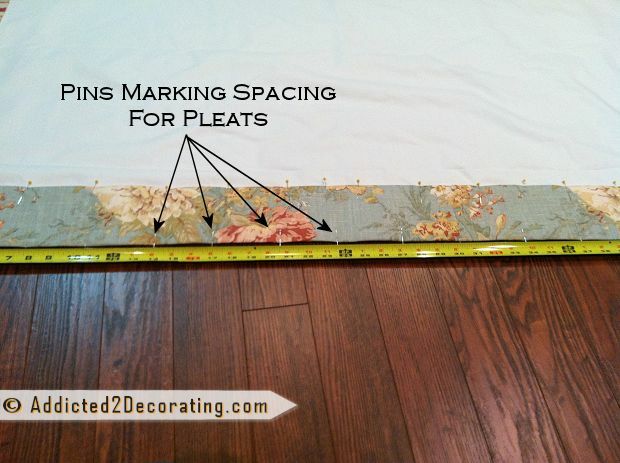 Measured up from the bottom edge of the fabric panel and place a mark with a ballpoint pen. Measured and mark the length in at least four different places. Then use a straight edge (I used a scrap piece of baseboard), and mark a straight line connecting your marks. Next, cut only the lining along the line. Be sure that you don’t cut your fabric!! Then pin the lining to the fabric all along the top edge of the lining. Now finish attaching the fabric panel to the lining by using a blind hem stitch along the length of both edges. See? You really do need that blind hem stitch! The only other option would be to top stitch the fabrics together, and that’s not pretty at all. That’s what you get when you buy cheap ready-made drapery panels from a big box store, and it’s little details like this that set apart the cheap ready-made stuff from the professionally-made custom stuff. 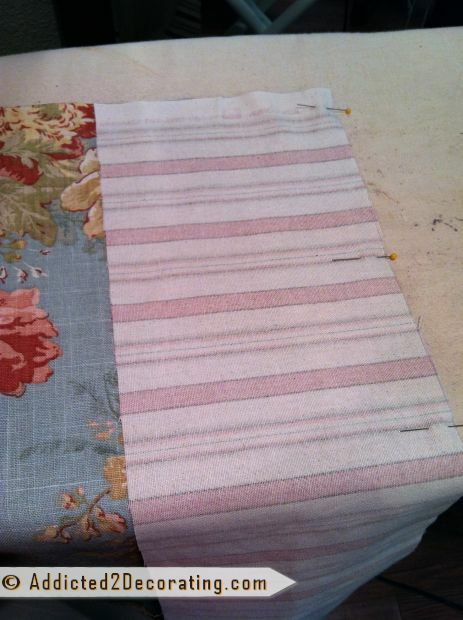 Now that the sides are sewn together, you can finish the header and work on the pleats. Start by placing crinoline (called “unwoven drapery header” at JoAnn Fabrics) along the top edge of the drapery lining, and pin in place. 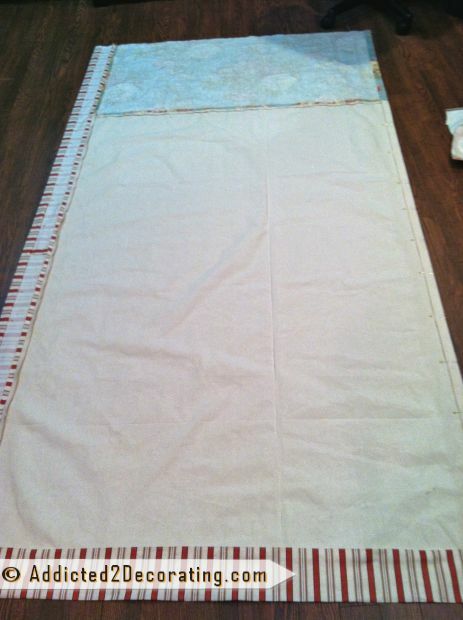 Next, cut the fabric that extends past the lining to 6 inches. Fold the fabric over the crinoline, and tuck the extra two inches under the crinoline. Pin in place. Do this along the width of the top of the panel. Now along the very top edge of the panel, use pins to mark where the pleats will go. Here is what it will look like when you’ve marked all of the spacing. I try to keep the spaces as close to 4 inches as possible, but that number can vary depending on the width of the panel. The first and last space need to remain flat, and I generally try to have seven pleats per panel (for single-width drapery panels). Now on the spaces that will be pleats, fold the fabric in half, with the front side of the panel facing out, so that the pins meet. Pin the fold together. 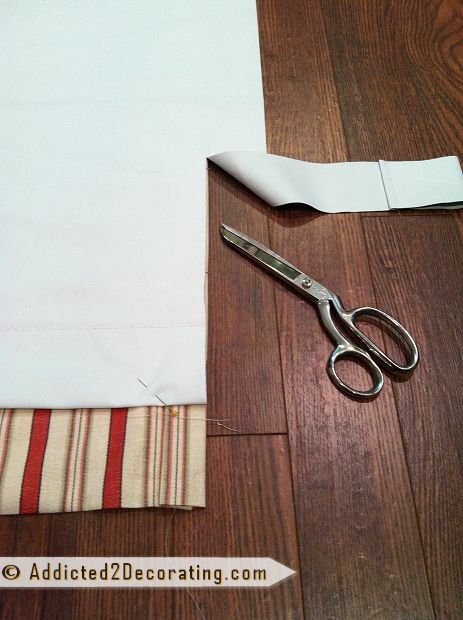 Now use your sewing machine to stitch parallel to the fold the entire length of the crinoline. 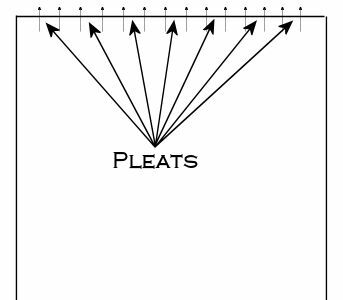 Repeat this for each of space that is supposed to be a pleat. That will create a fold on either side of the middle crease. Fold the other two folds up and pinch to crease the crinoline to create the pleat. 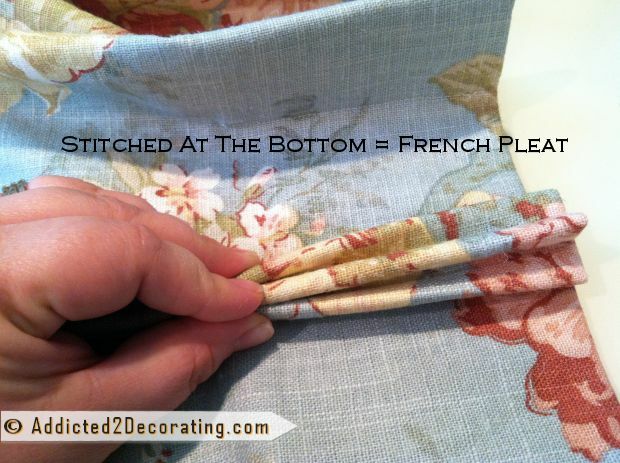 You can stitch the fabric towards the bottom of the pleat to create a traditional French pleat. 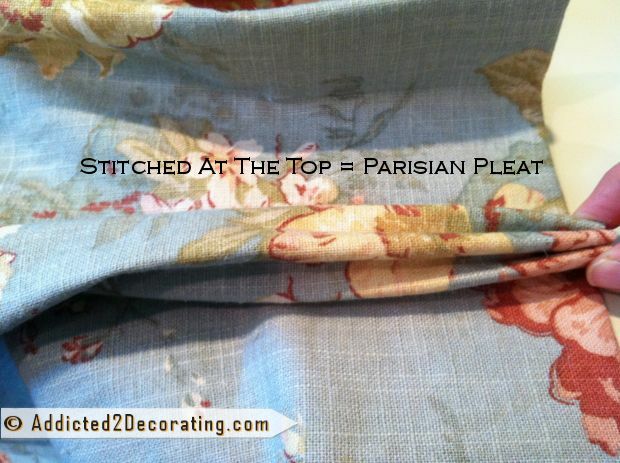 Or you can stitch at the top to create a Parisian pleat. Just to do something different, I chose to stitch somewhere in the middle on these draperies. Most sewing machines won’t power through this many layers of fabric and lining, so the pleats need to be stitched by hand. Double the thread, and pass the needle through all of the layers, close to the folds. Then pass the needle back through all of the layers, about 1/4″ over from the original stitch. Now remove the needle, and tie a knot. Be sure the knot is pulling the folds tight. Then trim the excess thread. Repeat that process on the other pleats. You’re so close to being done! Just a couple of finishing touches left. Right now, the bottom corners of the panel are folded and ironed, but not sewn in place. 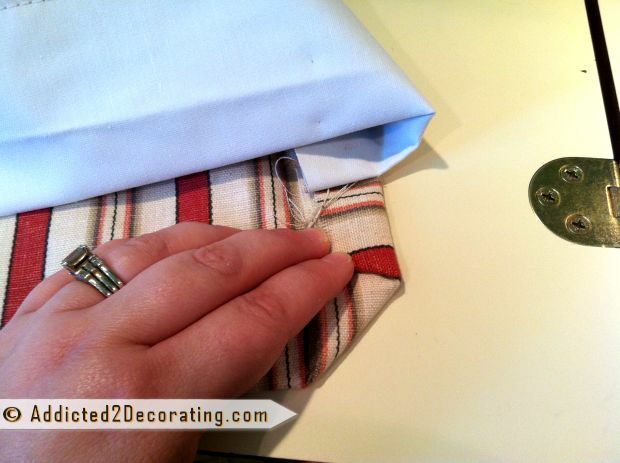 Now fold the corner up at a 45-degree angle along the inside ironed-in crease. And then fold again along the inside ironed-in crease. Pin, and sew in place by hand. Repeat this process on the other corner. Stitch both ends closed by hand, using a small inconspicuous stitch. Well, you’re done with THIS panel. 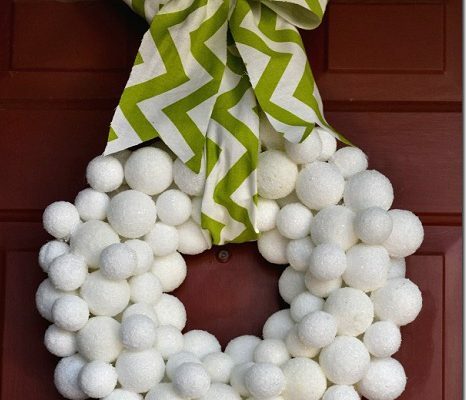 You probably need to make one more, and then you’re ready to hang your draperies! I purchase mine at Home Depot, but you can also get them at Lowe’s, Bed Bath & Beyond, and probably any other store that sells drapery hardware. 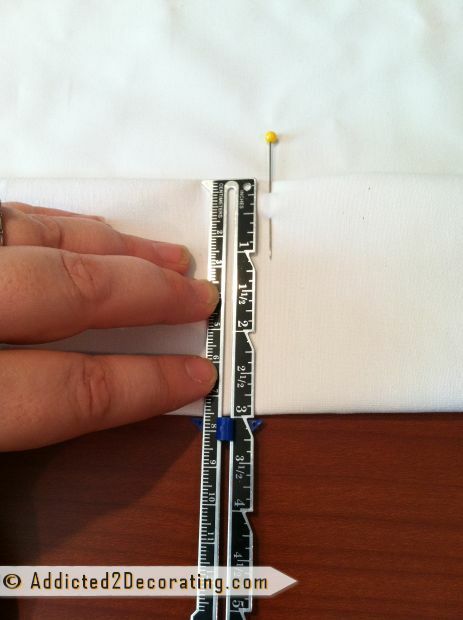 With the sharp, pointy part of the pin, place one pin behind each pleat, and one pin on each end of the panel. Be careful, because those things are sharp! 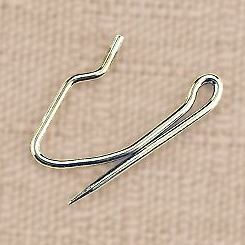 The hook-end of the pin will go through the eye screw on the drapery rings. I always use wood drapery rods and rings, and the rings always come with the clip-on things. Those clip-on things have no place on professionally-made drapery panels, so just take them off so that all you’re left with are the eye hooks. The very outside pin on each panel does not hook to a drapery ring. That part is called the “return”, and it hooks to an eye hook that you will place either in the wall or attach to the drapery bracket. I’ve described that process more in detail here. And with that, your draperies are done! The draperies for this window were done using the same method, but each drapery panel is two widths of fabric instead of one. On really large windows, it’s best to use double widths of fabric so that the draperies look substantial enough for the window. 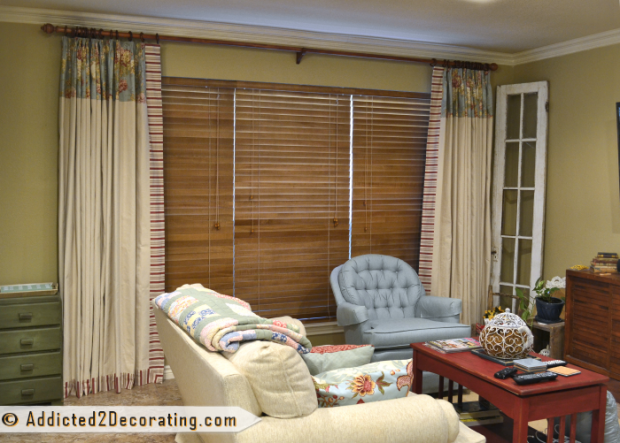 But for smaller windows, a single width of fabric is sufficient for each drapery panel. Next Post Make It Happen Monday - Bookcase Turned Pantry Finished! Wow! I love this step by step. The fabrics are so gorgeous together, and the pleats make them look so substantial. Just gorgeous! Wow, that is a great tutorial. Love the professional finishing. They look beautiful! I have the exact same sewing machine as you! I’ve been looking for this help for a couple of years. Wanting to make drapes out of drop cloth but lined to help with energy cost and sunlight. Thank you! I love your blog. So weird how I’ve never met you but feel like you’re my friend! Keep up the great work. Wow, thank you so much for this detailed tutorial. I really appreciate the work you do. You, my dear, are a genius and a true lady! Thank you so much for this. It’s Pinned and loved. Even a sewing lightweight can follow directions this clear, precise, and…yes…well-illustrated. Again blown away by your tutorials both the step by step photos and the verbiage. 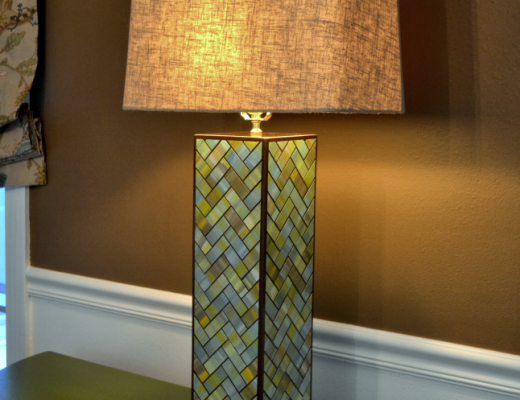 I love your mix of fabrics of the prints and the textures, they work really well together and with the room decor. I’ll definitely be referring too your tutorial, but first I need to figure out how much fabric I need – can you recommend a tutorial on how to know how much fabric you need for drapes? Omg…. My iPad had a glitch and posted my comments 3 times. Can you remove two? Great tutorial!!! Now I know why you were still up after midnight last night when all the texting was going on as the family travelers were checking in. 🙂 You did a really good job on this. I have curtains on the brain lately and those are stunning! I wish I had your patience! I’m impressed! When I was in college I took down the ugly dorm drapes and made new ones from a bed sheet and that tape that you stick the triple pins in to make new drapes form my dorm room. That was fine for that….but love your tutorial. I just might want to try my hand at the real deal again. Thanks Kristi! 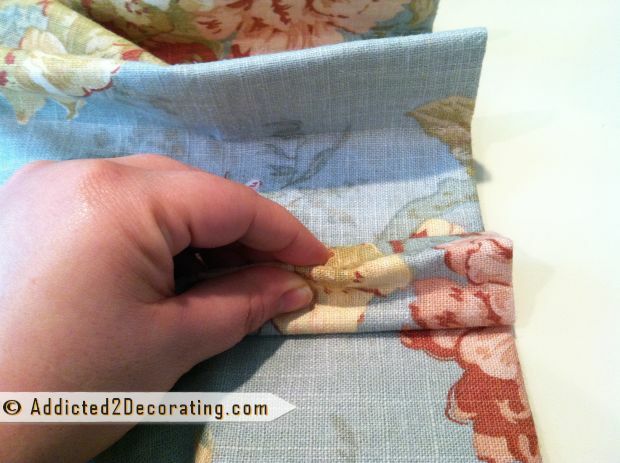 As a professional drapery workroom who loves to read diy blogs I can’t tell you how thrilled I am to have someone show how to make drapes the way a professional does. 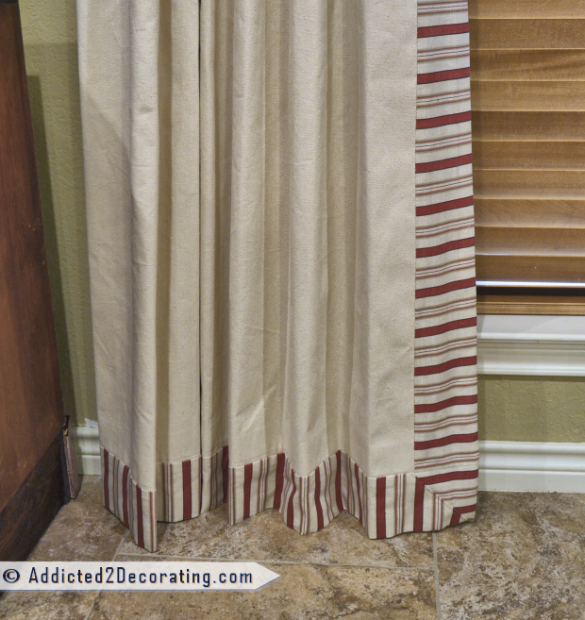 I understand that not everyone can afford to have drapes made by a professional, and I understand the desire to save money and still have beautiful drapes, but I’ve also been very frustrated by seeing unlined flat top drapes made out of drop cloths. Thanks for taking the time to blog about this and show diy’ers it’s not impossible to make drapes that are beautiful and well done. Awesome and detailed tutorial! Thanks for all your hard work! Thank you for this detailed and easy to understand and follow tutorial!! Thank you so much for this tutorial! I totally thought I knew what I was doing.. but this direction is so much better! 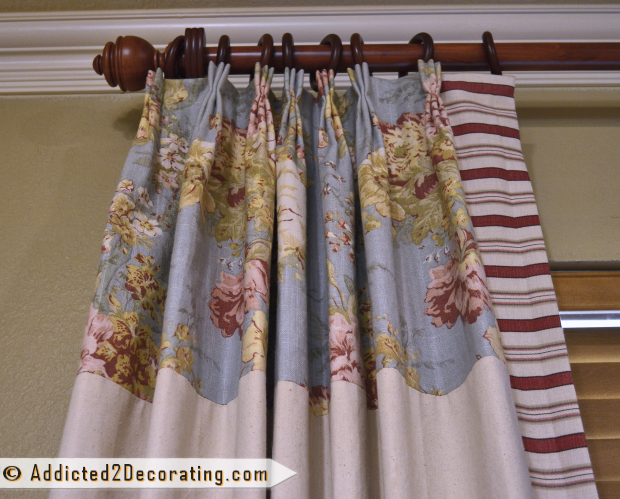 When I post my new drapes I will be linking back to your post! And I better go find my sewing manual! HA! I love these draperies! I know a lot of people would say that mixing two different patterns on window treatment is a no no, but I don’t agree, and I’m glad you don’t either. Actually, I was mostly just curious to see them, because I can sew, at all, so this tutorial was like reading mandarian chinese to me. 🙂 But I loved watching them come together, they are lovely. Thanks for sharing, wish I had your skill set! Wow. Those are beautiful. Ya got skills, that is for sure, even for a dropout 😉 I don’t know if I could ever trust myself making those, but perhaps someday I’ll give it a shot. Thanks for such a detailed tutorial. 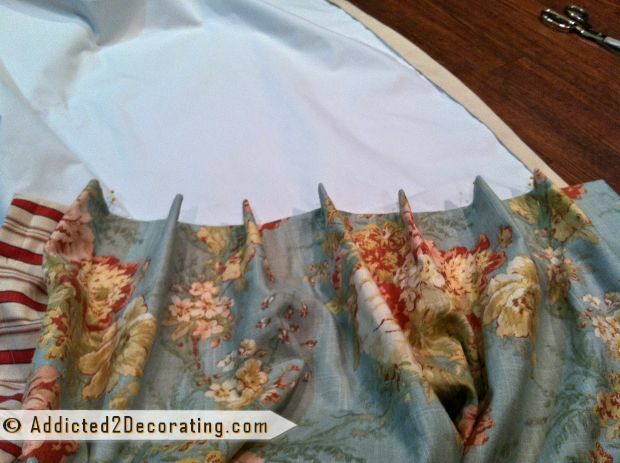 Kristi~ Thank you for the step-by-step instructions & FABULOUSLY HELPFUL PICTURES for these drapes! I’ve always just made them on my own w/o much to guide me, thinking “how hard can this be?” Well, it’s obvious that the attention to detail does matter and I feel much more confident in sewing beautiful drapes for our multiple family room windows. Thank you for simplifying & even mentioning the Joann’s labels on items. That will save me much time and potential frustration! 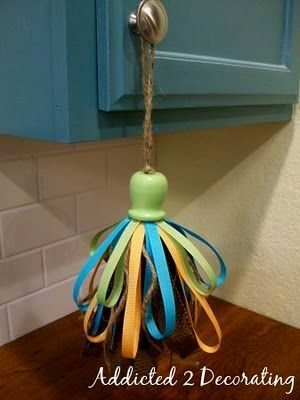 Love this idea for drapes, looks really good. 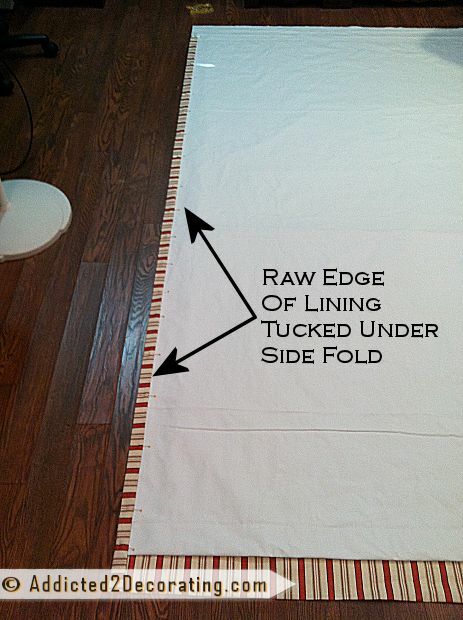 This is the best tutorial for lined, pinch pleat drapes I have seen!!! I’ve watched so many and could not understand a few of the critical steps. Thank you so much!! Hi! I LOVE this tutorial! It is very easy to understand. I am going to take a stab at it this weekend! I noticed in your finished picture, it looks like the drapes are double width, but the tutorial was for a single width panel. Is this correct? I would like mine to look as full as yours in the picture. Should I just add another full width or half a width to get the same look as yours? Thanks so much! Thank you so much for this tutorial! I am new to sewing, but plan to work up to this. 🙂 My grandmother was a wonderful seamstress and showed me how to make these when I was younger, but I just don’t remember anymore. I love your blog, too! Wow, what a great tutorial! I’m using it to make curtains for the first time and I’m so grateful That I have this info. The one place I’m stumped is how to iron the dim out fabric. My panels are quite wide so I had to double up the width and I want to iron the seam nice and flat. The problem is that I’m afraid to use anything more than the lowest setting on my iron. I tried steam and the backing started to disintegrate! Can I turn my iron up hotter? One of the best tutorials I have ever seen regarding sewing, especially to achieve a professional look. 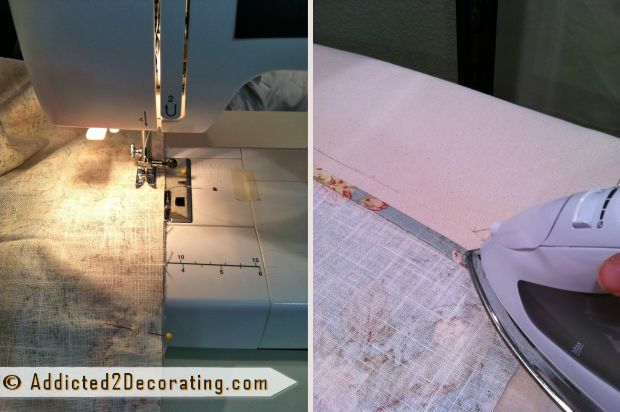 Thank you for showing the proper way to do it using a sewing machine, measurements, etc. and not fusible web. One could achieve excellent results by not trying to complete them in 30 minutes or less. Most sewing tutorials make me cringe due to the amounts of shortcuts. 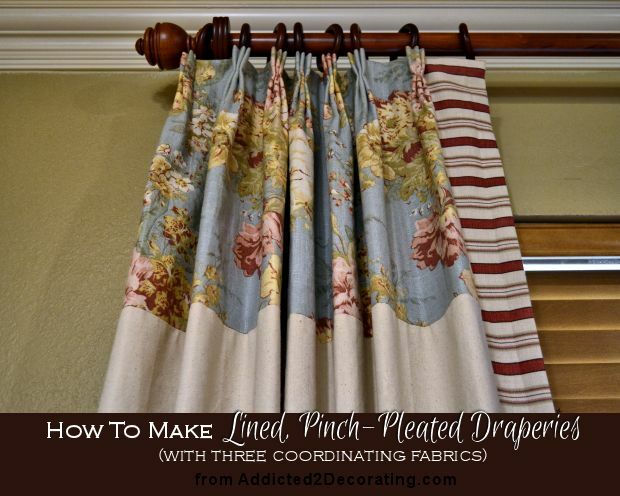 This is by far the best tutorial for making pinch-pleated draperies I have ever read. Trust me, I have read a lot of instructions and have always felt inteminated. You laid out every step logically and explained the details. Thank you so much! Thank you so much for this excellent tutorial! 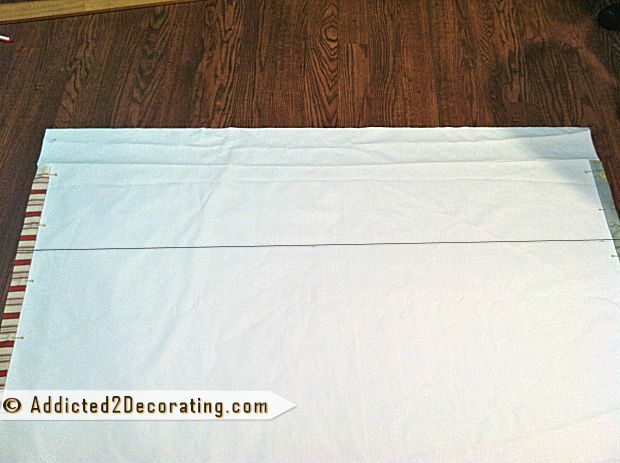 I browsed many sites looking for the best step-by-step way to make professional quality draperies. Yours is the best by far! I just completed new master bedroom draperies, and will soon start working on new ones for my family room. I feel so empowered and proud that I can now do this on my own and save hundreds on labor! Thank you for sharing! Great tutorial, makes it so simple. I was wondering if you could help me figure out how to do the spacing with these drapes. You mentioned 4″, does that apply to a standard 54″ wide curtains. I know with regular curtains you want the drapes to be 1.5-3 times the width of the window, but what about with pinch pleat windows? Thanks I appreciate your time. Thanks Kristi. I am learning so much from your blog. So glad I found you! Kristi, What a great tutorial. Thank you very much. I have a question about the bottom edge. Does the lining ever get sewed onto the bottom edge of the drapes? I can see that the fabric is hemmed on the bottom first, and then the later the lining is hemmed on the bottom. You even mention pinning them together (the lining 3 inches from the bottom hem), but it is not in the directions to actually sew them together. Is this correct? No, you don’t ever sew the lining to the fabric on the bottom edge. Each (the fabric and the lining) should be separate all along the bottom, with the exception of the side edges. I like your tutorial. In your class did you learn how to sew interlining as well? I just made a set of drapes, lined and interlined, following another tutorial that used mostly hand sewing. They look great but took forever to sew. I still have 3 more windows to go. I would like to use your method, but wasn’t sure how to do the interlining part. Would you have any suggestions? When I use interlining, I just cut it exactly the same size as the lining, and then put the two pieces together (lining and interlining) and treat them like one piece. I hope that makes sense. In other words, I just treat the lining/interlining layers as if it’s just one solid piece of lining. 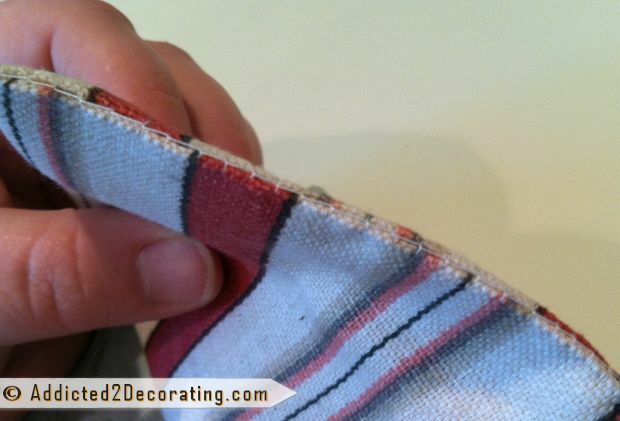 Of course, you’ll want to sew a hem in the bottom of the interlining (nothing to big — no four-inch hem necessary), and be sure that the interlining is a tad bit shorter than the lining so that it doesn’t hang down lower than the lining. Also, you don’t sew the bottom of the interlining to the bottom of the lining. Simply place the interlining on the lining, make sure everything is flat and wrinkle-free, and then treat the two as if it’s one piece of lining. But no, I don’t do more hand sewing simply because I’m using interlining. I am a professional workroom. You can buy lining that has inner lining attached to the lining itself. It is called duo lining. I use this instead of inner lining in most cases. Lighter in weight and easier on the machines. Also, the part where you closed the gaps together, try hand blind stitching them. Then you would see any stitching at all. 1) you detail the parallel pleat stitching, but you never mention sewing horizontally, either the crinoline to the liner or the crinoline, liner and fabric together. Do we never connect all three except in the parallel pleat stitching? 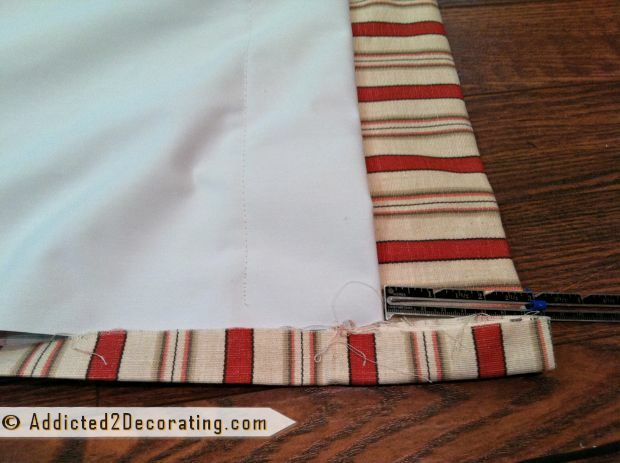 If we only sew at the pleat, how do we connect the crinoline at the outer edges of the header panel? 2) I’m confused by the pins in the first three photos in step 6. It looks like it will be a bit fiddly to unpin the crinoline-to-liner pins and repin all three after we’ve folded the top 6″ over and tucked in the 2″ – or am I missing something? Also, photo 2 has sideways pins at the top of the panel but then they get replaced with vertical pins along the top to mark the pleats in photo 3. I feel like I am missing something here, can you explain? Thank you so much for your help! I’m excited to get these curtains finished and to know I did it (with your expert guidance)! 1. It’s only the pleats and the stitching together of the very ends that holds everything together at the top. You don’t want to sew a horizontal line all the way through to the face fabric at the top because it won’t have as clean of a look on the finished drapery panel. 2. 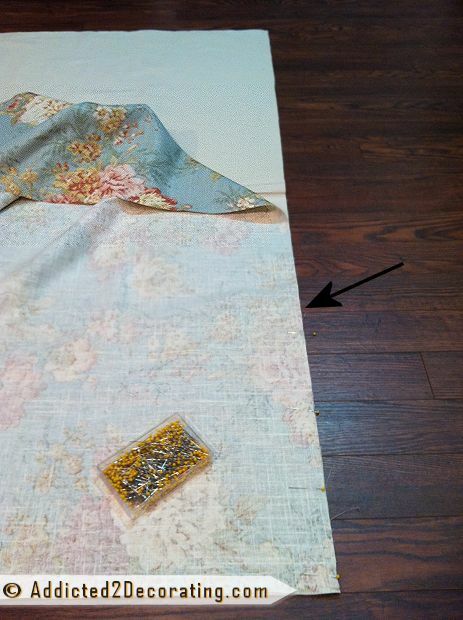 You do have to remove all of the pins shown in the first picture of step 6, add the crinoline, fold the fabric over, and repin the layers together. Then you use additional pins vertically to mark the pleats. Can you suggest where to find these workroom certification lessons. 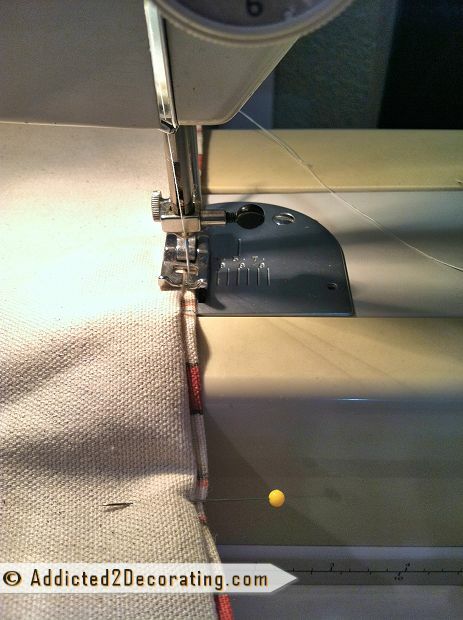 As a former owner of a drapery work room( retired now) I would make the hemming step easier by folding up the entire 8 inches that will ultimately make up the hem and press. Then open that fold and bring the raw edge up to meet the crease and press again. This makes a clean neat finish and you are not blindly folding by touch. 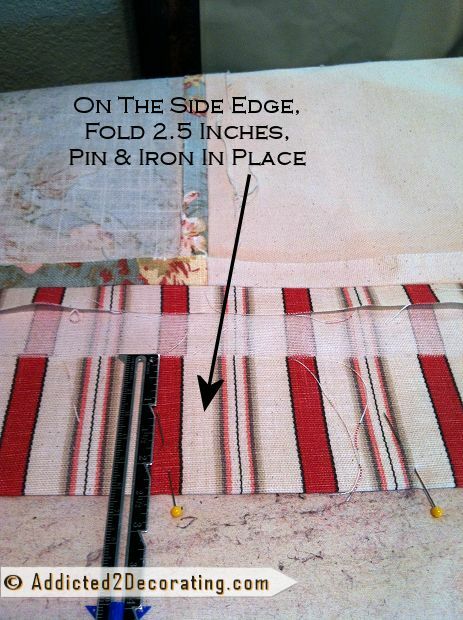 This method can be used for side hems as well as headers and linings. My workroom always used a 5 inch double hem to add weight and luxury to the finished draperies. I am using a medium weight cotton with the black out lining you suggested. I’m having trouble now that I’m ready to do a blind hem stitch on the sides to attach the lining to the fabric. It is too thick to fit under the presser foot on my machine. Any suggestions? I may have to repin them with right sides together, do a regular stitch down the sides and turn it right side out to get this done. Do you ever run into this with your fabrics? I’m so sorry that I’m just now seeing your comment/question. I’d love to know how you solved this issue. Is your machine older? I’ve never had that problem, even with the fabric I’m currently using for my living room draperies, and it’s very thick — meant for upholstery. I can still fit it easily under the presser foot. Hi, very useful post! I have been following your instructions as I make my lined curtains without running into any trouble, until I got to the heading crinoline. Do you lay the crinoline all the way across the top, from side-edge to side edge? Or should they start & end a small distance from the sides? I think I’ve figured out enough to muddle through on my own, but maybe your answer will help with my next set of lined drapes – because your blog has certainly been inspiring me! I cut mine about 1/4″ from the very edges of the fabric.